FREE Smuckers Uncrustables at 9 p.m. EST! 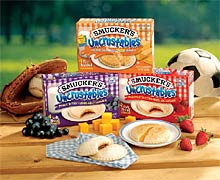 FREE Smuckers Uncrustables product coupons to the first 400 that submit an organizational tip. Limit 1 per household. Giveaway will continue daily until October 13th. Final Price FREE or $1.00 Money Maker! Kotex is giving away some FREE samples by mail! There are four different packs available (you can only choose one). Visit the website for details and to request your sample! Sunday's Housewares Deals daily deal is a Pedrini Passione 8 Piece Aluminum Cookware Set in Black for $31.00 (regularly $80)! The set includes : 5-1/2 quart Dutch Oven with glass lid, 3-quart sauce pan with glass lid, 1-quart sauce pan with glass lid, 10-inch fry pan and 8-inch fry pan. Features "Stay-Cool" comfort grip handles and an easy-to-clean, nonstick coating.